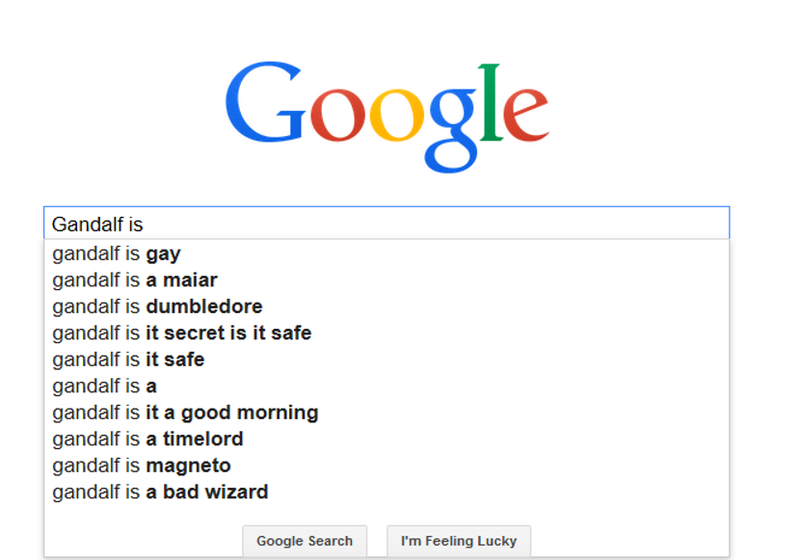 Google’s ‘Autocomplete’ function is meant to be a useful tool when searching for anything on the internet. The idea is to suggest search combinations most relevant to what you are looking for, in a sense predicting what you might type in. According to Google it is helpful as it saves time searching, offers spelling corrections, and favourite searches can be easily repeated (if you are logged in with this service.) 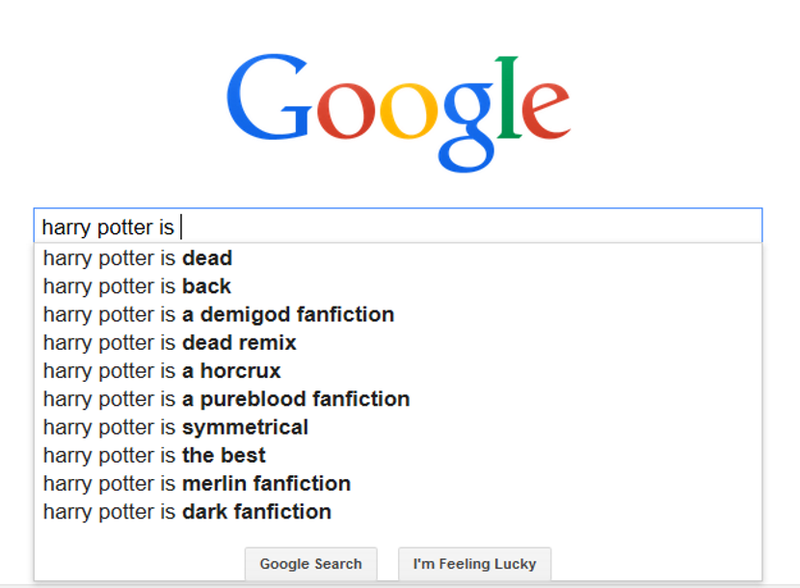 However, some of the results offered are really surprising and odd – as with many fantasy authors and their characters. Have a look for yourself! Me likey. However, this is not the only way to have a look at JRRT. If you enter the search term with Google Germany the critics’ eponymous line is in: “Tolkien is overrated.” Considering the fact that the European nations have their own amazing writers, often not translated into English, this does not come as much of a surprise. And with some influential UK critics chiming in – well, it’s fun to see, anyway! Even better, though, is any search on major characters, now very much mixed up with the film trilogy’s actors. 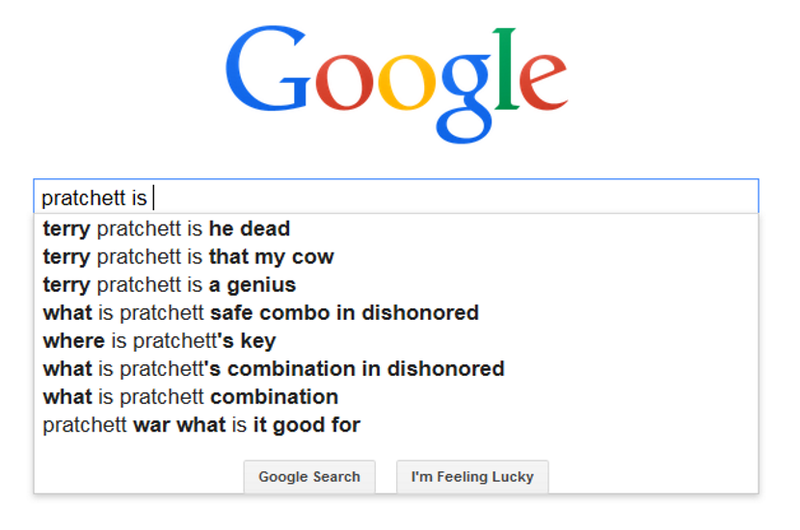 With Sir Terry Pratchett, master of Discworld, and probably the funniest fantasy author out there, two things are obvious: his illness and that ‘Dishonored’ seems to be a very popular game including a character called Pratchett. Read up on Pterry and what has made him the author we all love and cherish, written up by Neil Gaiman. And yes, he is a genius, too! The whole “… is a genius” thing seems not to be of much importance – or we’re having quite a few genies out there! 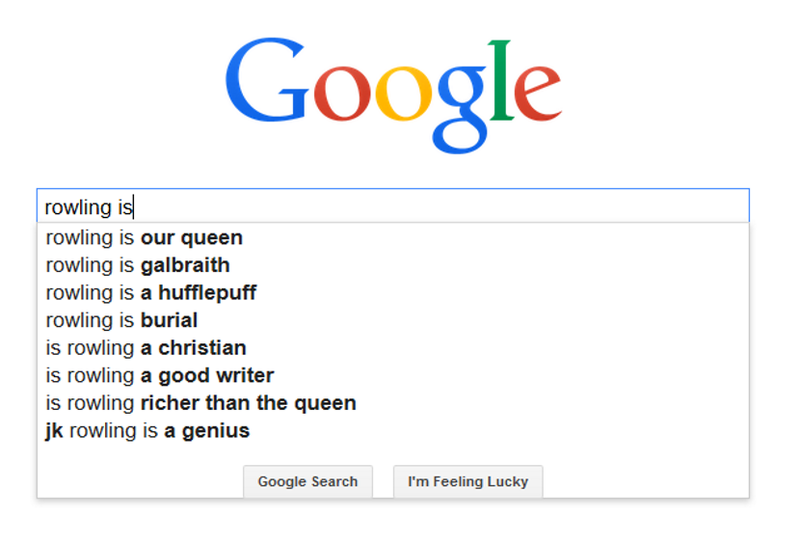 Interesting to see she appreciates Hufflepuff very much, indeed, what with their valours of hard work, patience, justice, and loyalty; her pen name when writing crime novels is Galbraith; and the typical question -when it comes to fantasy- is she a good writer? And yes, she is a genius, too. There! Now, for every single George R. R. Martin fan out there there can be only one question: “When is the next book” coming out? 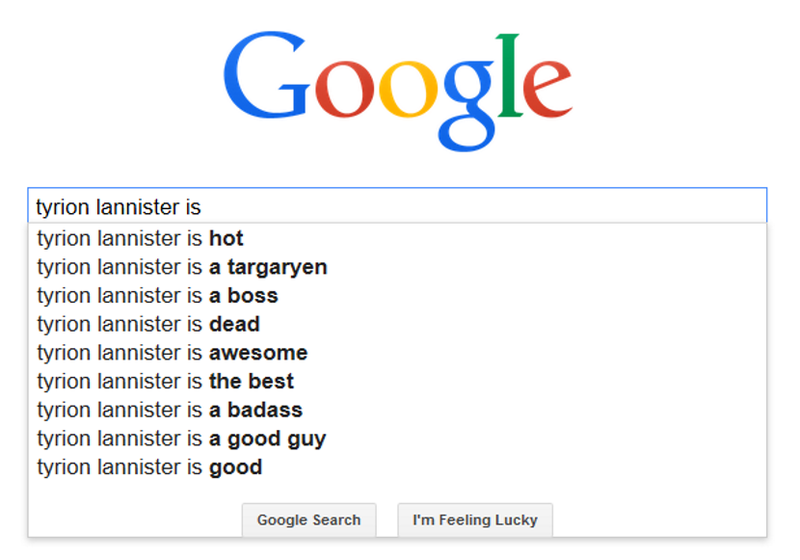 Some fans seem so fearful of him not finishing the series -called A Song of Ice and Fire, not “Game of Thrones”, by the way- that they go to Google search, posting: “George R. R. Martin is dead.” Nope, he isn’t, and yes, we’ll see the end the series with him alive. Fingers crossed, of course! Sad to note that both authors are, in fact, dead: Eddings died in 2009 and McCaffrey in 2011. And yes, if you haven’t read the Dragonriders of Pern, you ain’t no scifi-/fantasy fan! 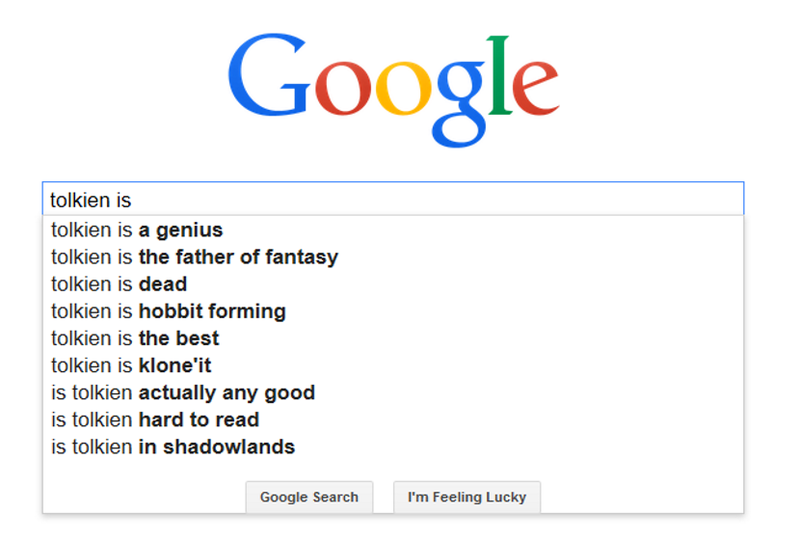 But if their wonderful tales aren’t shown on television or the big screen Google searches won’t change easily. Luckily for all of us, Peter S. Beagle, who brought us The Last Unicorn, is still with us and on an extended tour right now. Go and see the man who wrote the story and watch the awesome film! Now, quite obviously both the character from the books as well as the actor Peter Dinklage have hit it off with the fans. Now, with the last volume the Imp’s travels weren’t that much fun to read but he truly is a “good guy.” Let’s see where he is going. P.P.S. : If you find anything offensive you can report it, of course. There have been very unfortunate search results and Google has changed its approach to Autocomplete accordingly: Everything that can be measured can be manipulated.